In 1948, during an Alberta Intermediate league game between the Banff Mountaineers and Exshaw, Dr. Pat Constigan had a busy night. In the middle of the match he was summoned from his position on defense with the familiar, “Is there a doctor in the house?” He was duty bound, of course, to doff his skates and lay aside his equipment to deliver a baby girl. He returned in time to help his sextet to victory. To be granted the title of “doctor” is just about the highest honour an individual can receive, whether in academics or in medicine. So to many, it may seem curious to connect those upon whom such high intellectual demands are made to a physical game like hockey. However, in the early days of Canada’s national game, virtually every organized squad involved the well-to-do, who belonged to fraternities akin the country clubs of our day. The Montreal Amateur Athletic Association, for instance, was the first team to have their names engraved on the prestigious Stanley Cup. Other aggregations, like the Toronto Canoe Club or the Argonaut Rowing Club, for example, abounded with doctors, lawyers, and other professionals as members. University teams made up a large segment of the leagues in those fledgling years of the sport. The Dentals, whose moniker is worth a thousand words, won the OHA crown and the Allan Cup in 1917. The squad was stocked with both future dentists and physicians who were attending the University of Toronto. It was a dentist, in fact, who was responsible for the organization of the world’s first openly pay-for-play shinny circuit. Dr. Jack Gibson, who skated in the amateur ranks around Berlin (Kitchener), Ontario, set up his practice in Houghton, Michigan and was the founder and captain of the Portage Lakers, a barnstorming shinny septet. After dominating every opposition outfit the previous season, in 1904/05 they took their place alongside other Michigan mercenaries, Pittsburgh, and eventually the Canadian Soo, in the formation of the International League. Two of Smylie’s teammates on the Dentals were Dr. Jerry Laflamme, who became a referee of some note, and Dr. Charles Stewart. A star net minder with the Hamilton OHA Tigers, the latter was chosen as the original goalie for the new NHL contingent in Boston in 1924/25. He, according to the press, was “50 per cent of the Boston aggregation!” However, as the 1926-27 schedule wound down, recurring eye problems forced him to turn in his Beantown sweater. The year that “Doc” Stewart bade farewell to the world’s premier loop, William Joseph Carson joined the Toronto NHL team, by then renamed Maple Leafs. Another dentist by trade, he quickly gained the reputation as a first rate puckster. When a poll was taken of spectator favourites in the 10 NHL cities, Carson was chosen as the Queen City representative. Therefore it is one of those mysteries surrounding pro sport why he was sold to Boston for cash following his second (and improved) campaign in Toronto. He was the hero in the Bruins’ 1929 Stanley Cup win over the Rangers, scoring the deciding marker in a 2-1 triumph! After seven games for the International League London Tecumsehs, he retired to pursue his chosen occupation. However, the thrill of slashing skate blades and bounding pucks was just too much for the poke-checking magician, and in the fall of 1933 he donned the livery of the New Haven Eagles of the Can-Am circuit, where he was immediately named team captain. Following a single schedule back in harness, he hung up his blades to become team scout-but soon settled into his dental practice in Elora, Ontario. The 1920’s and 1930’s featured a number of profiles of other pro players who chose a medically-related bi-vocation. For instance, “Duke” McCurry, although born in Toronto, chose to study molar management in Pittsburgh, PA. During his courses there he hooked up with the old Yellow Jackets squad. When this amateur club morphed into the NHL Pirates, he moved right up to the next level of the game. Always taking a rough and tumble approach to hockey his stats included a generous amount of penalty minutes. This mean streak was demonstrated one evening in 1928 when his fledgling pay-for-play sextet faced the Boston Bruins. Suddenly his stick found itself in collision with Eddie Shore’s jib. When the referee “overlooked” this rule violation, the “Edmonton Express” took matters into his own hands. On the way to the sin bin the two exchanged pleasantries and the Duke’s lumber made contact in the same manner again. True to form a melee resulted. He eventually returned to the Queen City set his dental practice. Dr. Stan Brown was a star with the Toronto Dentals which played out of the University of Toronto. His talents caught the eye of the powers-that-be who managed the school’s Varsity Blues. After a lengthy stop in Sault St. Marie, he got his chance in the NHL with the New York Rangers in 1926-27. He was traded to the Detroit Cougars, and after a season became a part of the Montreal Canadien’s organization. He spent four years with their farm club in Windsor, coached the club for a short time, then retired to his more permanent profession. Bill Carse is one of the few skaters who had the privilege of being a teammate with his brother on the same NHL team. During the 1941-42 campaign both siblings were are part of the Windy City aggregation. This was his final kick at the Big Time can, having skated for the Rangers in 1938-39. He coached in the PCHL in the late 1940’s then, rather than return to his native Alberta to brave the frigid temperatures of Edmonton, he migrated to Honolulu to practice dentistry. Bobby Copp played a full season as a rearguard with the Toronto Maple Leafs in 1942-43. But feeling the call to military service, he joined the Canadian army as a member of the Royal Dental Corps. stationed in Ottawa. He joined the local Quebec Senior Hockey League club, helping his Senators to bring home the Allan Cup in 1949. According to local newspaper reports he was a key member of the Barber Poles. There was a note of panic when he was injured and the team tried to survive without his service. Even though he made a two-game appearance with the Buds in 1950-51, he made the nation’s capital his home and the site of his 58 years of dental practice. Gerry Wilson, M.D., father of Carey, and grandfather of Colin, specialized in orthopedic and rehabilitative medicine in Winnipeg, Manitoba. Although born in Edmonton, he worked his way through the more easterly western province’s minor hockey system. He starred with the St. Boniface Canadiens in 1953/54, moving to their Montreal Junior namesakes in 1955. Unfortunately, his junior career was fraught with recurring shoulder and knee injuries which took him through five orthopedic operations. again, with the result he missed the next two hockey seasons altogether. He had managed three games with the parent Montreal Canadiens in 1956-57, but was eventually sold to the rival Maple Leafs. A serious knee injury while playing in the minors in 1959-60 brought his career as a shinny mercenary to a screeching halt. The realization that he would never competitively again play the game he loved so much was totally devastating. So it was that while in Florida contemplating what his future might be, he awoke one day to the realization that he should be a doctor. It meant playing catch-up in his education. But he persevered and finally completed courses at the University of Manitoba and earned his degree. Two of the games monumental events took place eight years apart. The “Summit Series”, featuring Paul Henderson’s dramatic goal in 1972, is one. The other is remembered as the 1980 “Miracle on Ice”, when the USA pulled off an unheard coup in that year’s Olympics. Nine members of that squad made it to the NHL. Some better-known competitors were Neil Broten, Ken Morrow, and Mike Ramsey. The rest, including Captain Mike Eruzione settled into a more routine way of life. Bill Baker was a solid performer during the entire tournament, but is remembered for his tying goal against Sweden, which allowed the Americans to advance to the medal round. He was captain of the University of Minnesota varsity sextet during his years of studying to be an oral surgeon. He was selected by the Montreal Canadiens in the 1976 draft. He also patrolled the blueline for the Colorado Rockies, St. Louis Blues, and New York Rangers. He realized his ambition and carried out his practice in Brainerd, Minnesota until his retirement in 2015. Following four years at the University of Alberta, Gregg played with Canada’s National Team, which required him to take a one-year hiatus from pursuing his dreams. But, almost in storybook fashion he went back to it during summers, and did a rotating internship. During his first stint with the Oilers from 1983 through 1988, he admitted it was difficult to fulfill his four-year residency. That fell into place when he “retired” in the spring of 1990. In 1991 he accepted Vancouver’s invitation to join them through the waiver draft, but skated only 21 games before hanging them up for good. Although he occasionally diagnosed his teammate’s hurts and stitched a few faces, he claimed the Oilers were not paying him to be the team doctor. Nevertheless, on a Minneapolis-to-Edmonton flight in 1989 he did respond to the “Is there a Dr. in the house?” appeal, and tended to a heart attack victim. A number of NHL’ers have chosen the operating room or dentist chairs over the years. Phil Samis, Al Simmons, and Fred Arthur come to mind. 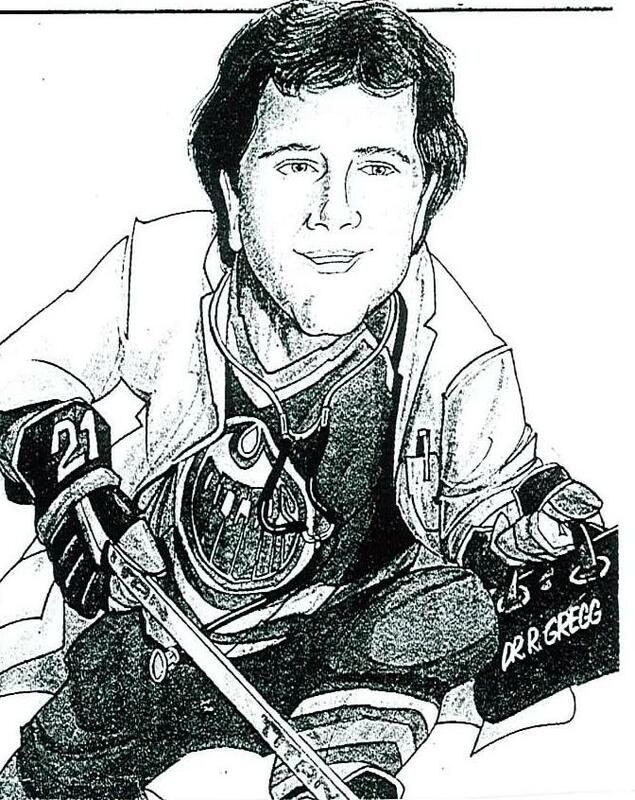 But not since hockey’s infancy has anyone other than Randy Gregg managed to combine the hockey stick and stethoscope so effectively at the same time.